Lock in a great price for Medora Auri Family Beach Resort - rated 8.7 by recent guests. Everything! Location, view, room, and most importantly the staff. Everyone we had dealings with were, without exception, courteous, understanding and helpful. We had a problem when a bus hit our rental car and the staff couldn't do enough to help us. Location was great! 2 pools available at the Hotel, one of them for kids. Beach is just across the walkway, so it’s up to you to choose. Great facilities and view, also from the gym. We had the best view from our Balcony. Concierge was super-friendly and arranged a private parking spot and helped us with Everything we needed. A great variety for Breakfast, But the quality was not as Good. Extra location, really could not be on better pkace, great beach, clean hotel, very friendly personal and breakfirst and diner was great, really great, a lot of choice. Great for familly as well as for couples only, relly recomend it to all. Breakfast is super! Very good pet friendly hotel with beautiful view! 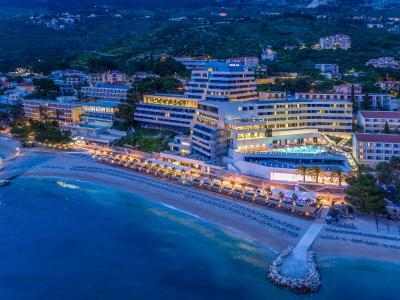 One of our top picks in Podgora.Completely refurbished in 2016, the beachfront 4-star Medora Auri Family Beach Resort features outdoor swimming pools and a wellness centre with a variety of saunas, a whirlpool bath, a relaxation room and various massage and beauty treatments. A buffet restaurant with show cooking serves local and international specialties. Free WiFi is provided in all areas. Guests are welcomed in air-conditioned rooms that include a balcony overlooking the Adriatic Sea or the Biokovo Mountain. A flat-screen satellite TV and a minibar are also included, while private bathrooms feature a shower or a bathtub and free toiletries. A smartphone is provided in each hotel room for guests to use. Guests can get in shape at the on-site fitness centre that provides panoramic views of the Adriatic Sea. A children's playground caters to all age groups of children. A varierty of day and evening entertainment is provided for guests of all ages, while various sports activities can be enjoyed at the hotel or in the surrounding area and include outdoor tennis, jet ski, diving or parasailing. The city of Makarska is 6.2 miles away. Split Airport can be reached in 85 km, while Dubrovnik Airport is at a distance of 99.4 miles. This is our guests' favourite part of Podgora, according to independent reviews. Medora Auri Family Beach Resort has been welcoming Booking.com guests since 25 Feb 2011. This comfortable air-conditioned room includes a balcony overlooking the park and features a flat-screen satellite TV and a minibar. A private bathroom comes with a shower and free toiletries. This air-conditioned room comprises two separate bedroom, each with a balcony offering views of the Adriatic Sea. It also includes 2 flat-screen satellite TVs and a minibar. A spacious private bathroom comes with a shower and free toiletries. This spacious air-conditioned room comprises two separate bedroom, each with a balcony offering views of the Adriatic Sea. It also includes 2 flat-screen satellite TVs and 2 minibars. A large private bathroom comes with a shower and free toiletries. This air-conditioned room includes a balcony and features a flat-screen satellite TV and a minibar. A private bathroom includes a shower and free toiletries. This comfortable air-conditioned room includes a balcony with views of the Adriatic Sea and features a flat-screen satellite TV, a sofa and a minibar. A private bathroom comes with a shower and free toiletries. This air-conditioned room includes a spacious sea-view balcony furnished with sundeck chairs and features a flat-screen satellite TV, a sofa and a minibar. A private bathroom includes a bathtub and free toiletries. This air-conditioned room includes a spacious balcony furnished with sundeck chairs and features a flat-screen satellite TV, a sofa and a minibar. A private bathroom includes a shower and free toiletries. This spacious air-conditioned room comprises two separate bedroom, each with a balcony offering views of the Adriatic Sea. Every room also includes a flat-screen satellite TV and a minibar. A large private bathroom comes with a shower and free toiletries. A separate toilet is also provided. This suite comes with a spacious balcony furnished with sundeck chairs and offering views of the Adriatic Sea. It features a flat-screen satellite TV, a sofa and a minibar. A private bathroom includes a shower and free toiletries. This spacious suite is located on the top floor of the hotel and features a large furnished terrace providing views of the Adriatic Sea. It also has an additional balcony with views of the Biokovo Mountain. The suite comprises two bedrooms and includes a seating area with a flat-screen satellite TV, a sofa and a minibar. A dining room is also included. A spacious bathroom comes with a shower and free toiletries. This spacious suite is located on the top floor of the hotel and features a large furnished terrace providing views of the Adriatic Sea. It includes a seating area with a flat-screen satellite TV, a sofa and a minibar. A dining room is also provided, while a spacious bathroom comes with a bathtub and free toiletries. This air-conditioned room comprises two separate bedrooms, each with a balcony offering views of the Adriatic Sea. Every room also includes a flat-screen satellite TV and a minibar. A spacious private bathroom comes with a shower and free toiletries. This air-conditioned room comprises a a balcony offering views of the Adriatic Sea. The room also includes a flat-screen satellite TV and a minibar. A spacious private bathroom comes with a shower and free toiletries. House rules Medora Auri Family Beach Resort takes special requests - add in the next step! Please note that the accommodation units are located in the main hotel building and the pavilion buildings. The pavilions can be reached via a short path that passes next to the swimming pool area.